January 25th, 2010 by KTU | Filed under 3. Basic Structure, Notes on Approaches. You can buy rough-sawn lumber at most saw mills. Most of the time what you buy is “air dry” from stacks that have sat out in the mill’s yard for a year or so. The moisture content is still high, say 20%, but nothing like true green lumber right off the saw. 50% greater cross-sectional area (for a 2×4), which makes it stronger and stiffer. This is highly significant in bending/beam applications as with joists and rafters. Rustic appearance from the raw sawn surfaces. Lower environmental footprint from reduced transportation and processing costs. Supporting local saw business (the saw mill, the loggers, and the wood lot owners). Weight…more than 50% heavier for a 2×4. This only really matters if you’re hauling it a significant distance. Varied appearance due to weathering in saw mill’s yard. Variation in length of 1/8″ – 1/4″. Shrinking possible across the grain (but not typically along the grain). Interestingly, rough-sawn lumber is not usually cheaper than conventional finished lumber, especially for 2×4s. The big box retailers like Home Depot and Lowes price their 2×4s as loss leaders; so low that there aren’t many local saw mills that can compete on price. Still, the dimensional lumber is not a very big expensive item on most projects, so the price differences don’t matter much. 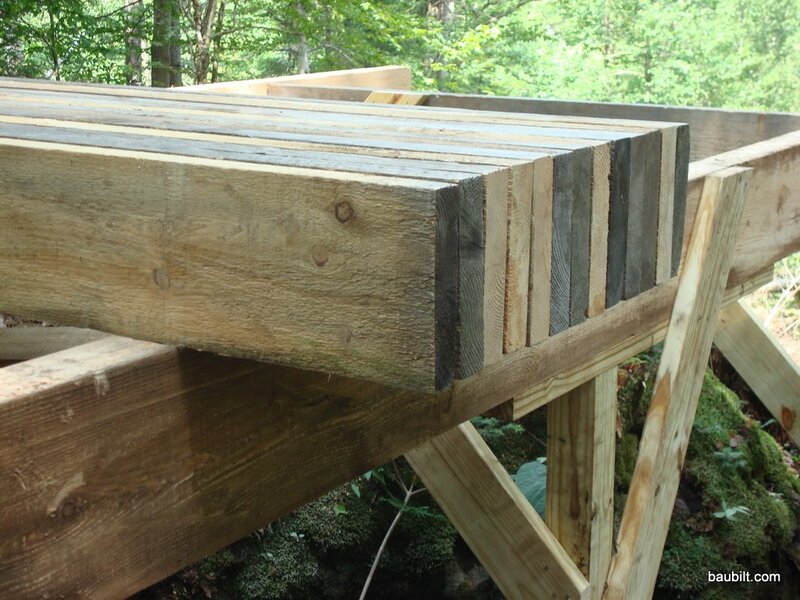 Some of my research suggested that rough-sawn would not be as straight as conventional lumber. I didn’t find that to be true. The dimensional lumber at most lumber yards is not the nicest wood…it can be warped and full of knots. I found that the rough sawn from my local mill was, if anything, straighter than what I could get at the lumber yard. I found working with rough sawn no problem at all. The only thing that requires some attention is the lengths of the sticks. You can take one of two approaches: you can sort the lumber a bit so that the differences between adjacent sticks are not too great and just live with it, or you can trim each stick to length. I mostly took the “live with it” approach and ended up with a structure that was very plumb and true. I love working with rough sawn lumber, it is only a problem when building to code because it is not dimensional. stronge yes, more actual structural wood per stick YES, but no paperwork to prove it because it is not inspected and graded. So, build cabins, sheds, RV’s whatever you want to call your living place, yes, as long as it is not a “house”. Happy to live in a home instead of a “house’. Prices vary widely by species, location, grade, and dryness. FIrst, find the sawmill closest to you and then ask for their prices. However, in Vermont I think you’d pay about $5/piece for 1×6 x 16′ in spruce/pine/fir. I have a camp that has rough sawn 2×6 for ceiling rafters. It is 20ft. Wide with a carrying wall 8ft in on one side. I want to raise the roof up 4ft to make additional space. (Not a heavy use room) Will these 2×6’s be strong enough to be used for the floor? They are 24″ on center.